Laying down that solid groove for the rest of the band is a joy! 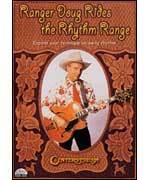 In this book, 26 tunes are transcribed in varying levels of difficulty: a basic rhythm approach for the newcomers, then more adventurous and different approaches. Songs are included from styles spanning western swing, fiddle tunes, ballads, jazz standards and a polka. Playing tips are included for each song, plus you'll learn rhythm history, guitar theory, the right hand, a basic chord chart, and more.